NASA’s Orion spacecraft is deep into the business end of its preparations for the Exploration Flight Test -1 (EFT-1) next year, with associated hardware providing a glimpse into the future of the vehicle. 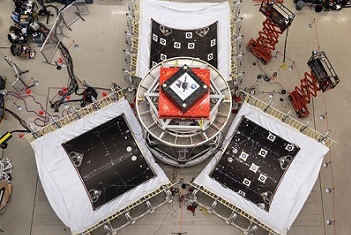 While the stage adaptor test article prepares for pressure testing, Lockheed Martin successfully jettisoned the Service Module’s three protective fairing panels, certifying the hardware for flight. The test on the Service Module (SM) panel jettison system is a big milestone for EFT-1, not least due to the problems occurred during initial testing earlier in the year. The jettison of Orion’s three protective fairings – each 14 feet high and 13 feet wide – will take place at around the 560,000 feet point of ascent during the EFT-1 flight. 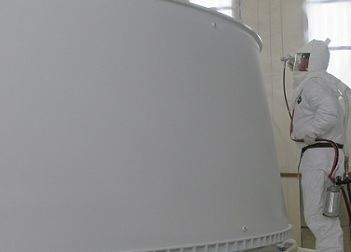 They are required to remain in place during ascent to protect the Service Module radiators and solar arrays from heat, wind and acoustics during the ride uphill. So as to ensure they will work as planned, Lockheed Martin engineers have been simulating their jettison sequence at their Sunnyvale facility in California, using a series of precisely-timed, explosive charges and mechanisms. According to NASA, the first test earlier this year resulted in all the pyrotechnic mechanisms and bolts separating as planned. However the third fairing panel did not completely detach, caused when the top edge of the fairing came into contact with the adapter ring and kept it from rotating away and releasing from the spacecraft. The second test was far more successful, this time adding a thermal element – as had been planed for this latest test, regardless of the issues endured earlier in the year. 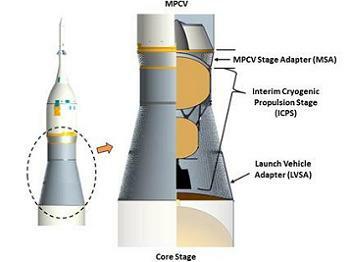 Lockheed Martin engineers used strip heaters to heat one of the fairings to 200 degrees Fahrenheit, simulating the temperature the spacecraft will experience during its climb to orbit. The command to fire the six breakable joints and six explosive separation bolts resulted in all three fairing panels jettisoning with the velocity and trajectory predicted tolerances. “This successful test provides the Orion team with the needed data to certify this new fairing design for Exploration Flight Test-1 (EFT-1) next year. 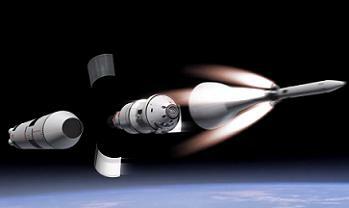 The test also provides significant risk reduction for the fairing separation on future Orion manned missions,” noted Lance Lininger, engineering lead for Lockheed Martin’s Orion mechanism systems. The NASA Orion team – fresh from the success of the first power up of the EFT-1 vehicle inside the Kennedy Space Center (KSC) Operations and Checkout (O&C) building – portrayed the fairing panel test as part of their goal of ensuring they tick all the boxes before Orion takes its debut ride into space. 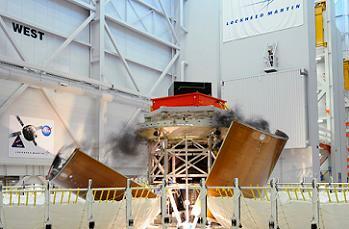 A third and final test on the panel separation system is set to take place in early 2014. While the EFT-1 Orion continues its outfitting in Florida, additional work is also taking place at the Marshall Space Flight Center (MSFC) in Alabama. The latest update relates to the application of white paint on the stage adapter that will be a key item of hardware between Orion and the United Launch Alliance Delta IV rocket tasked with lofting EFT-1 into orbit. The adaptor is not only set to ride with the Delta IV-H, but also with the Space Launch System, with engineers with the SLS Spacecraft & Payload Integration team at MSFC responsible for both the EFT-1 and EM-1+ adapters. Once the EFT-1 flight is complete, the hardware will change call signs to the MPCV (Orion) Stage Adaptor (MSA) between Orion and the SLS. The recent painting relates to the top coat for the adapter, a special paint that protects the hardware and its components, like sensors, from electrical discharge on ascent. A test article twin of this adapter soon will be attached to the diaphragm – which keeps gases away from the spacecraft — to undergo pressurized testing in mid-November at Marshall. The tests will certify the hardware for flight conditions, with additional data set to be received from the EFT-1 flight next summer.